Add a splash of modern styling to your decor with Ivory Palace Interlocking Mosaic Tile. A seemingly random blend white and beige tones glass strips and stone pieces forms this 12 inch. x 12 inch. mesh-mounted tile, infusing your space with a dimensional look and a contemporary ambience. The mixed-sheen, mixed-finish tiles will invigorate any residential or commercial setting and are versatile enough to be used outside or on a fireplace surround. The variable-length bricks within each tile look particularly enchanting as kitchen backsplash or bath wall, and also display stunningly on a feature wall. Alaska Gray River Stone 12 in. x 12 in. Mesh-Mounted Mosaic is a Natural Stone Marble. This tile has random pieces of flat polished rock mounted on a 12 in. x 12 in. mesh sheet for ease of installation. A blend of various shades of gray makes it an attractive option to complement any install in a wide variety of design schemes, including kitchens and bathrooms. Note: Inspect all tiles before installation. Natural stone products inherently lack uniformity and are subject to variation in color, shade, finish, etc. It is recommended to blend tiles from different boxes when installing. Natural stones may be characterized by dry seams and pits that are often filled. The filling can work its way out and it may be necessary to refill these voids as part of a normal maintenance procedure. All natural stone products should be sealed with a penetrating sealer. 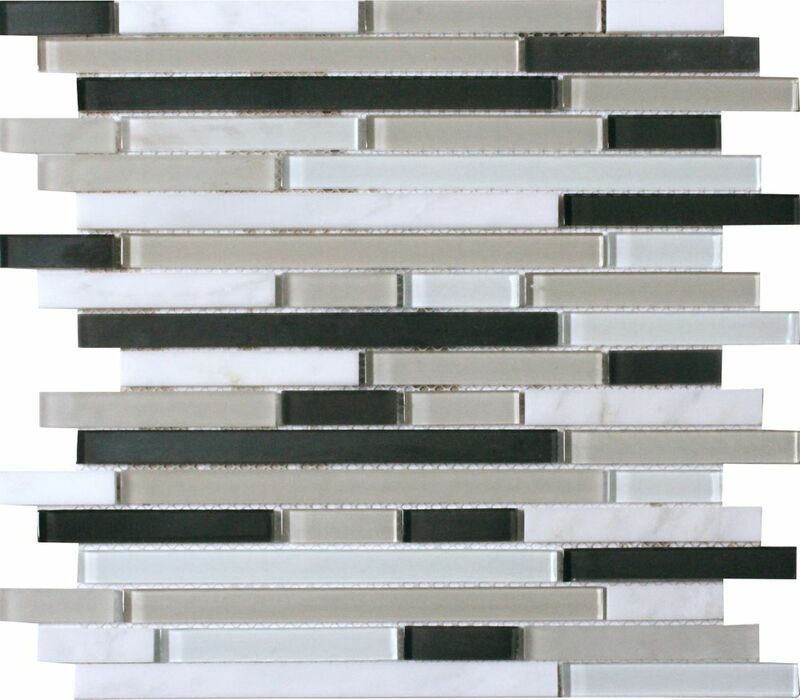 With Antico Silversmith Interlocking Glass Wall Tile, it's easy to add a splash of contemporary styling to your decor. This attractive tile features a woodlook glass with seemingly random arrangement of glass tile strips on 11.81 in. x 11.81 in. mesh sheet that makes installation a much easier process. Constructed from durable, frost-resistant glass material, this tile is suitable for installation on walls and countertops. This beautiful tile has handsome gray tones, an unglazed, smooth finish, a high sheen and slight variations in tone that makes a perfect complement for a wide variety of design schemes. With the MS International 12 inch x 12 inch Icelandic Blend Mosaic Wall Tile, it's easy to add a splash of contemporary styling to your decor. This attractive tile features an arrangement of marble, glass and metal tile on a 12 inch x 12 inch mesh sheet that makes installation a much easier process. With elegant shades of white and grey glass complemented by random silver metal and marble strips, this tile creates a distinct pattern and is suitable for kitchens, bathrooms and other residential or commercial spaces. MSI Stone ULC 12 in. x 12 in. Fossil Canyon Interlocking Glass Mesh-Mounted Mosaic Tile is an attractive mosaic featuring glass tiles in a beautiful blend of earthy hues. It's a great tile to use on a wall installation. The high-sheen tile is frost resistant, so it can be used indoors and outside. Ivory Palace Interlocking Pattern 12-inch x 12-inch x 6mm Glass Stone Mesh Mounted Mosaic Tile Add a splash of modern styling to your decor with Ivory Palace Interlocking Mosaic Tile. A seemingly random blend white and beige tones glass strips and stone pieces forms this 12 inch. x 12 inch. mesh-mounted tile, infusing your space with a dimensional look and a contemporary ambience. The mixed-sheen, mixed-finish tiles will invigorate any residential or commercial setting and are versatile enough to be used outside or on a fireplace surround. The variable-length bricks within each tile look particularly enchanting as kitchen backsplash or bath wall, and also display stunningly on a feature wall. Ivory Palace Interlocking Pattern 12-inch x 12-inch x 6mm Glass Stone Mesh Mounted Mosaic Tile is rated 4.4 out of 5 by 8. Rated 4 out of 5 by mary from worth the money. some white tiles (which are not glass) came broken. No big deal to me. Easy to repair. Rated 5 out of 5 by jamesagain from Beautiful and you can't beat the price! These were less than $5/square foot and make a big impact for a small amount of money! I used a Dremel tool to cut to fit... I am not sure what you would do if you didn't have that kind of tool, but it worked great for both the glass and the marble pieces. It takes a lot of grout to fill in all the cracks - be sure to use NON-SANDED or you will scratch the glass. Went in quick and looks great. Rated 5 out of 5 by Lucy from Great look for the price We bought this to spruce up our kitchen. Haven't had a chance to install but laid out it looks classy and we are excited to see the project completed. Rated 2 out of 5 by MiltonMom from Color not acccurate! I was excited to find an affordable tile in gray and white and APPEARED to be exactly what I had in mind for our complete kitchen remodel as the backsplash, but the color is WAY off. It is mostly beige and off-white, which doesn't go with the white cabinets, gray floor and gray/ white/ black granite counter. They will be returned today. Check your colors! Rated 5 out of 5 by Jody from like the look It hasn't been installed as yet so can't really give a complete review of this product as of yet, but anxious for it to go up in the bathrooms, two, in the next few days.